Be one of the first to grow the astounding Rose of the Year 2018! Delivered as fresh potted plants in 3l rose pots. 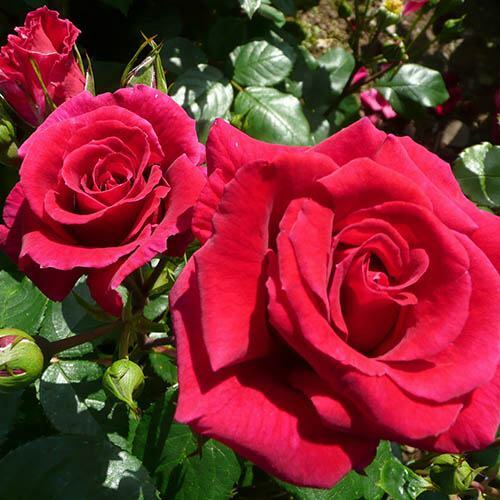 A 'floribunda' variety, it flowers repeatedly throughout the summer with as many as 20 blooms in large clusters. The plum red flower heads contrast beautifully against the deep green foliage and are fully double with many petals and will grow to at least 10cm across! With a pleasant, delicate scent, it's not overwhelming, but perfect for sitting back and enjoying on a warm summer's evening. Perfect for planting en masse in borders where it will fill in any pesky gaps and spaces, or make a real feature of it in a large patio container, its flowers can also then be cut for pretty indoor displays. Delivered as a fresh potted plant in a 3L rose pot.